Posted on 2019-01-16 10:53:47 GMT+0000 by Neil Godfrey. This entry was posted in Biblical Studies and tagged Gospel of Mark, John the Baptist. Bookmark the permalink. I’m sure there are those who believe that King Arthur knighted Robin Hood. I would like to follow the implications from the premise (that the baptism is not embarrassing since the baptism is allegory of the crucifixion, and the latter is not embarrassing). If baptism = crucifixion, then who is John the Baptizer? He would be the “killer” of Jesus, during the baptism. Is John surprised in virtue of the effects of the baptism, just as the centurion is surprised about the effects of the crucifixion? In that precise moment, John seems not realize nothing about the baptism of Jesus, in Mark. But then he is said, in Luke, to be surprised/scandalized about the “new” teaching of Jesus (“are you the coming Christ?”). But there is not this surprise/scandal, in Mark. So, what is the effect of the baptism of Jesus, for John, in Mark? The his immediate imprisonment, after precisely the time of 40 days of Jesus in the wilderness. We know that, precisely 40 years after the presumed death of Jesus in the fiction, Jerusalem is captured by the Romans. As RG. Price explains, the Jews kill Jesus, and God destroyes the Jews (by using the Romans). So, John “kills” Jesus during the baptism, and after 40 days, God destroyes John (by using Herod). So the message is: the fate of John the Baptizer prefigures the fate of the Jews the Killers. Already Jean Magne demonstrated that John the baptiser (falsely so-called) is wholesale a late corruption stemming from a step by step Judaization and Euhermerization of the heraldic figure of mystery cults, such as the one from the fourth tractate of the Corpus Hermeticum. Mark’s gospel is at the late end of a long development and by no means the earliest account of Johnny B and Jesus. who is John the Baptizer? He would be the “killer” of Jesus, during the baptism. If purification by immersion was central to the practice of temple priests, then perhaps John the Baptizer represented a temple priest. Ory reports that in Mandean literature, John first reluctantly baptizes Manda d’Hayye (the “Living Gnosis”), then in return accepts a baptism that spells corporeal death but grants eternal life to the soul. Mk 10:38-39 But Jesus said unto them, Ye know not what ye ask. Are ye able to drink the cup that I drink? or to be baptized with the baptism that I am baptized with? And they said unto him, We are able. And Jesus said unto them, The cup that I drink ye shall drink; and with the baptism that I am baptized withal shall ye be baptized. John the Baptist is considered an early example of Merkabah/Merkavah [Chariot] mysticism, which continued to develop into producing a distinct set of writings (leaving its impression on Rabbbinic Judaism, as well). What was formerly termed “Hekhalot literature” (visit to the heavenly temple) is now considered to belong to the wider category of Merkabah mysticism. Meditating on the Merkava[h], the Chariot Throne, was one of the two main streams of early Jewish mysticism (the other one was meditating on creation). This stream centered on visions such as those found in the Book of Ezekiel chapter 1 (about the chariot) and Isaiah 6 (about the Temple), or in the hekhalot (‘palaces’ or ‘sanctuaries’) literature concerning stories of ascents to the heavenly palaces and the Throne of God (despite the word Merkabah not explicitly appearing in Ezekiel 1). In a ground-breaking study, Rachel Elior determined such Jewish Mysticism emerged as an alternative focus for spirituality in the absence of the Temple, embracing a mystical world devoted to sustaining religious liturgical tradition and ritual memory based on supertemporal relationships with ministering angels in supernal sanctuaries [Three Temples: On the Emergence of Jewish Mysticism (Littman Library of Jewish Civilization) 1st Edition]. The key Hekhalot literature (such as Maaseh Merkabah, ‘Working of the Chariot’) are accounts of mystical ascents into heaven, divine visions, and the summoning and control of angels, usually for the purpose of gaining insight into Torah. John was often portrayed or described as a revelatory prophet who saw [fore-saw?] ‘heaven’s mysteries’, a tradition that seems to go back to Palestine and a re-baptizing group. Daniel Boyarin and Alan Segal have regarded Paul the Apostle’s accounts of his conversion experience and his ascent to the heavens as the earliest first person accounts we have of a Merkabah mystic in Jewish or Christian literature (Timothy Churchill has argued that Paul’s Damascus road encounter does not fit the pattern of Merkabah, and notes this experience is not described in Paul’s letters. He also noted Acts does not claim to be a first-person account). Effectively, the Mandean episode about John’s baptism reflects more the Matthean version, since there John realizes the identity of who he is going to baptize reluctantly (while in Mark he didn’t realize it). The ”fulfill all righteousness” of Matthew 3:15 would be both the purification of the spiritual John (=new Israel) and the death of the carnal John (=old Israel). The same ambivalent meaning of Matthew 17:25. But in Mark it is hard to see a redemption of John: his sin is the absolute ignorance about the identity of the baptized Jesus, the same sin of the Jews (and of the Archons in Paul). And John is buried without hope of resurrection. His baptism comes “from heaven” (Mark 11:31), insofar the death of Jesus is wanted by God (and the pharisees didn’t know this). But his baptism comes “from men” insofar the death of Jesus is the sin of the Jews (and the entire people of the Jews didn’t accept this). The baptism or rebirth/purification ritual is something that every initiate had to go through. The king(Jesus is a king) goes through a royal initiation ceremony where he becomes deified or connected with god. Here’s an example from Egyptian royal ceremonies. Pharaoh is Horus in the primeval water. Death has no power over him. So the baptism and transfiguration of Jesus is just part of the initiation process that the king would go through and then eventually the initiates into mystery cults would go through. There’s nothing embarrassing about it. Jesus as portrayed in the gospels is in the role of the king/initiate. His baptism, transfiguration, and resurrection are all part of the initiation ceremony. John is in the role of the one who “opens the way” or “prepares the way”(Mark 1, Matt 3, John 1) for the king. He plays a role in the transfiguration and coming of the king/son of god. The reason for such certainty is said to be that no follower of Jesus would fabricate a story in which Jesus appeared to submit to the authority of John; the event was too well known to be avoided. Godfrey, Neil (2 October 2011). “That Mysterious Young Man in the Gospel of Mark: Fleeing Naked and Sitting in the Tomb”. Vridar. A. Baptism as dying and rising with Christ. Paul in Romans 6 shows us that there were early Christians who understood baptism’s immersion into water as symbolic of participating in the death of Jesus, and the emergence from the water as symbolic of participation (now or in the future) in the resurrected life of Christ. Matthew 20:20-28 has significantly omitted Mark’s reference to baptism in the words of Jesus in this same episode. “Matthew seems to be opposed to this interpretation of baptism, perhaps as reflecting too much a pagan influence.” — footnote p. 537. Thus there can scarcely be any doubt that Mark 10:38-39 makes oblique reference to the sacraments and that, furthermore, the baptism is seen as a dying in relation to the dying of Christ. could partake, and, in time, spread across the known world, along with the worship of Isis and Sarapis. For our purposes here, both of these elements separately and in combination suggest that the Isis initiate did indeed go through a process of identification with the god Osiris, and that this fact would have been the assumption behind the entire initiation process. In the first palce, the ancient form of the Isis-Osiris mysteries clearly has the kings, and later normal people, identifying with the god Osiris in the hope of unification with him in the afterlife (and even, possibly, in his resurrection). This is indisputable. We have no reason to think that the worship of Isis and Osiris (Sarapis), as it spread throughout the Graeco-Roman world, changed it’s essential myth in any great way. The initiate of the first century would surely have partaken in the mysteries akin to those practiced throughout the history of the Isiac cult. This is where the identification of Osiris and Dionysus becomes most important… As Griffiths (Apuleius of Madauros, p.52), an Egyptologist and scholar of the Isiac religion, puts it, ‘there is a parallel’ to the idea of identification with Christ ‘in the Isiac’s attitude to Osiris. I don’t necessarily have any answer here, but I see the baptism, transfiguration and crucifixion has three key linked scenes. It’s a progression and all of these things are highly related to one another. These are the three big events regarding the development of Jesus. We have the baptism of Jesus by JtB with JtB being “secretly” identified as Elijah, then we have the transfiguration where JtB’s secret identity is referenced with the questions about Elijah, then we have the crucifixion where there is appeal for Elijah to save Jesus (but he can’t because he has been killed). What it all means I’m not entirely sure, but it does seem to me that these three major events are tied together in the mind of the writer. I find the whole question of “embarrassment” complete nonsense that is derived from a completely unsupported perspective. The whole issue of embarrassment assumes that a perspective and objective of the writer of Mark for which there is no evidence. My view is that Christians from the very beginning of totally misunderstood Mark, and it never meant what even the earliest Christians and other Gospel writers thought it meant. Would you characterize Mark as a cultus handbook, published for intra-cultus distribution and not for public distribution. How many similar extant cultus handbooks are there from this period? I do not think we should expect any to have survived, unless popular preservation occurred as per Mark. Yeah, these are all part of the process of becoming “divine”. It’s the same things that the king and initiates into mystery cults would go through. Baptism/purification, transfiguration, death, and resurrection/rebirth are all part of the ritual that transforms the king/initiate into a divine being. Some kings were even given a divine birth myth to show that they were the son of the creator. Jesus is being portrayed as the new king/messiah of the Jews so the writers of the gospels are having Jesus go through the royal initiation in the stories they’re writing. Notice in the above quote the royal “Ka” was shared by previous kings. In GMatt when Jesus is transfigured he’s seen with Elijah and Moses, previous prophets. They all share the “spirit of god” like the pharaohs shared the royal “ka”. It’s a royal initiation ceremony. I’ve added links to the titles you quote from. I’d like to follow those up for background information. (I’ve posted before on Assmann’s methods and Litwa’s work.) I am not keen on seeing a direct borrowing from Egyptian rituals by Christians for reasons I think I’ve already set out. But the more we know about the lives and literature of the ancient world the richer our vision of early Christianity’s world becomes. There’s a chapter by Assmann about “Water rites in ancient Egypt” in the same book I cited in another comment: In Ablution, Initiation, and Baptism: Late Antiquity, Early Judaism, and Early Christianity — but it is in German. Yeah, I can understand that. I personally suspect there may have been some direct borrowing, mainly from the Hellenistic cult of Isis and Serapis but I also think that these initiation rituals that involved the king and initiates into the mystery cults were just a part of the culture that Christianity came out of. I would like to read that. You can trace the death and rebirth baptism/water rituals from Ancient Egypt to the Hellenic cult Of Isis and Serapis to Christianity. I’m not sure if you find anything like a baptism/water ritual that involves identifying with a dying and resurrecting savior in 2nd temple Judaism. There is no ’embarrassment’ to the story whatsoever other than that the whole Jesus story is about ’embarrassment’ of deity being constrained. Embarrassment the point of the Jesus story. Being born — think of all the messy fluids, the crying — virgin or no virgin how ’embarrassing’ is that for a deity? And why if a deity is born, why not in fact in the fanciest palace as the top prince around rather than in a manger? Having to eat, or at least having to give the appearance of having to eat, as is implied in the gospels — how demeaning for a deity!!! Surely a deity could survive on inhaled air (or less) and not have to pretend otherwise! And for a deity to be imprisoned in flesh — that must be as embarrassing as it can get in deity-world. Then there’s having to put up with people trying to school you, having to persuade people to become disciples, having to get some sense into these dunderhead disciples. Having crowds that, even if friendly, are — really by definition — infinitely too small for what is required by the status of God. To submit one’s self to a superior for baptism would be part of the routine of the era. It is almost jarring that it isn’t “embarrassing” enough in that the baptism is by a super-duper extra-special baptizer who was momentarily seemingly extra-extra-superior to one’s self. The whole narrative is one of embarrassment. That’s what it’s about. The embarrassment is the essence and substance of the entire story. Sometimes popular opinion is entirely wrong. However I believe that almost everyone throughout the ages, believers and nonbelievers, have recognized that the entire Jesus story is one of ’embarrassment’ and correctly so. That’s what the whole Jesus story is about. That’s basic. I think I can understand where you are coming from. Yes, when we imagine ourselves in such situations and think of real-life details of the kind you have referred to, yes, there is all that related embarrassment. But when we are doing historical inquiry, we have to work by different rules. One of the fundamental rules is to work only with the words in the text. We never bring other experiences into the text but always try to work with nothing but the words that the author has chosen to put down for us to read. The creators and editors of the Jesus stories themselves may well have understood and desired that the story contain ’embarrassment’ (that it was a key feature, not a bug). The point of the whole Jesus story as it now exists and has existed for centuries is one of ’embarrassment’: deity made flesh, in a position where he has to go through with being crucified and mocked. Whether hypothetically speaking we assume the current Jesus story was concocted in the 2nd or 3d century or whether it is historical, its creators almost surely saw as intrinsic to the story the paradox of the ’embarrassing’ situation of deity being humiliated one way or another, whether directly, by having to submit, or by having apparent successes overturned but just continuing on with dignity. As usual I may have written poorly, but the point is that whoever created the narrative, whether (hypothetically speaking) they were reporting what they had witnessed or were creating fiction, very likely saw Jesus as having strength-through-weakness-and-humiliation (various’embarrassing’ conditions). It’s not just I or the tens if not hundreds of millions of people over many centuries who have seen the Jesus story as one of persistent put-downs, frustrations, and mockery by events and people (“embarrassments”), but quite likely the creators of the orthodox versions of the stories themselves saw the story much the same way. The certainly wrote as if that is what they could have meant to such an extent that it seems perverse to imagine that they didn’t intend to record a story of a successive diverse ’embarrassments’ culminating in the crucifixion between two thieves having to go through the script of asking the father-deity why-have-you-forsaken-me. It is the scholars who may be overthinking things by imagining that ’embarrassment’ might be a problem rather than a key intended point or even the main intended point. I think their ’embarrassment’ argument is emperor-without-clothes wrong. Divinity degrees etc notwithstanding, they don’t seem to Get what the Jesus story of basic Christianity is about and has been intended to be from at least fairly close to its beginning by its earliest writers, at least those whose versions prevailed: serial ’embarrassments’ borne with dignity. ‘Embarrassment’ strengthens the story, and would have seemed absolutely congruent with it even (to give an extreme example) to a hypothetical believing disciple of a historical Jesus who had witnessed one defeat or overturned success after another just as much as to some editor in the 2nd or 3d century. it would fit the narrative fairly nicely if some 4-th rate itinerant drunk were to come around baptizing Jesus along with 46 other kids, nearly forget him in the river, and then him half-drowned out calling him ‘Jessica’ by mistake and then drop him in the mud. When Jesus gets any breaks in the gospels they are temporary and partial, almost as if mockery. 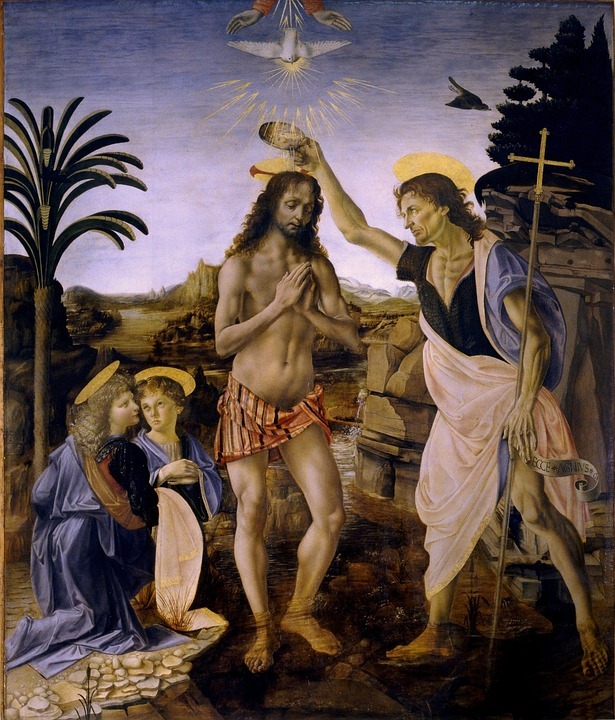 (Here, for example, the fancy John the Baptist, in theory a potential mentor for a great Messiah, gives him the special baptism treatment–but John ends up getting executed.) Keeping, even growing, an essential dignity no matter what while being mocked, embarrassed, destroyed, where even the little successes seem at best ambiguous, is the story.